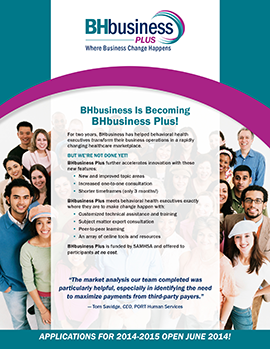 BHbusiness Plus is funded through a contract with the Substance Abuse and Mental Health Services Administration (SAMHSA). It offers customized, virtual technical assistance and training to behavioral health executives at no cost to participants. The goal is to help behavioral health providers identify and implement customized change projects that expand their service capacity, harness new payer sources, and thrive in the changing health care environment. The program empowers participating organizations to actually make quantifiable changes, rather than just learning how to do so. It links participants into specific learning networks that focus on a specific topic of interest and provides opportunities for networking and peer support. Everyone in a learning network receives hands-on expertise and guidance to initiate, continue, and complete business operations changes. resources designed to be meaningful to learners, providing practical action steps to meet individual challenges. Over 1,000 provider organizations have participated in BHbusiness, gaining the knowledge to make and in many cases have actually implemented significant changes to improve business operations. collaborating with other agencies and organizations to improve coordination of SAMHSA activities focused on addressing homelessness and building effective partnerships; and measuring meaningful change. developing two sustainable implementation guides—one that promotes effective collaboration among law enforcement, homeless service providers, and the community and the other that helps direct service staff and people experiencing homelessness how to go about getting or replacing the various types of ID documents. AHP updated, enhanced, and field tested two Evidence-Based Practices KITs focused on people experiencing homelessness—the Permanent Supportive Housing ToolKIT and the Integrated Treatment for Co-occurring Disorders ToolKIT. In addition, HHRN has conducted led multifaceted, interagency policy academies on Chronic Homelessness (CH) and fostered the development of collaborative relationships with federal regional partners. Substance Abuse and Mental Health Services Administration. Permanent Supportive Housing: Building Your Program. HHS Pub. No. SMA-10-4509, Rockville, MD: Center for Mental Health Services, Substance Abuse and Mental Health Services Administration, U.S. Department of Health and Human Services, 2010; updated 2015. 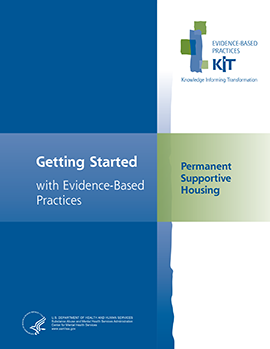 Retrieved from http://homeless.samhsa.gov/Resource/How-to-Use-Evidence-based-Practices-KITs-Permanent-Supportive-Housing-48828.aspx. Through AHP's work, HHRN has provided assistance to more than 50 federal grantees, along with coordinating in-person and virtual grantee-to-grantee model of practice workshops. HHRN has served as a resource for SAMHSA through outreach and education, virtual and in-person expert panel sessions, website, videos, and other tools. The WCF project supports the Substance Abuse and Mental Health Services Administration's (SAMHSA) advancement of state-of-the-art knowledge around substance use and mental health needs of women and families through supporting leaders, workforce development efforts, product development, and expert consultation. The Women, Children, and Families Technical Assistance Project (WCF TA Project) utilizes a multipronged approach to increase the field’s capability for meeting the needs of women, adolescent girls, and families across the nation, which includes working with policy makers, providers, and leaders committed to improving women's services throughout the nation. creation and implementation of the Women’s Addition Services Leadership Institute (WASLI). AHP also provides expert consultation on gender responsive prevention, intervention, treatment, and recovery support services for adolescent girls, pregnant women, and families with children. Under this project, AHP provides general support for SAMHSA’s WCF and Families agenda, including technical assistance and logistical support, along with some support for the National Association of State Alcohol/Drug Abuse Directors (NASADAD) Women’s Services Network. AHP has been providing training and technical assistance through the WCF project since 2008. AHP provides subject matter expertise and consultation to SAMHSA, NASADAD, states and community groups on effective interventions, treatment and recovery support for women and families. AHP created and administers the national Women’s Addiction Services Leadership Institute (WASLI), a six-month leadership program. Nearly 100 associates and more than 40 coaches have participated, with a 100 percent graduation rate. AHP developed and presented the highly popular Girls Matter! (six-part) and Women Matter! (five-part) webinar series, with thousands of online participants, which are now archived and available for viewing and CEU credits.